Almost everyone experiences stress from time to time, and while a small amount of stress can motivate us, too much or prolonged stress can be damaging to both our physical and mental health. There are many things in life that can cause stress, including work, relationships, family issues and financial problems. For some people, stress causes them to adopt unhealthy coping methods such as smoking or drinking - and while this may feel like a quick fix, ultimately these are covering the issue. Recognising what causes you stress and learning how to manage these feelings effectively, ultimately, is the healthiest and most effective way to feel good and live a happy life. Stress is an innate reaction embedded from our caveman days. Humans had to deal with threatening situations, which caused our brains to release a range of ‘stress chemicals’ such as cortisol and adrenaline to provoke what is known as the fight-or-flight reaction. The fight reaction would give us a burst of energy, ready to fight for our lives, while the flight reaction would encourage us to flee from danger and protect ourselves. These days, we rarely encounter threatening situations. However, our brains continue to react in this way when we are under pressure. Stress typically begins as pressure – from ourselves or others – and if we are unable to cope with this pressure, we feel stressed. The effects of stress will differ from person to person, but if left untreated it can lead to illness. When we experience pressure without an option for fight-or-flight, the stress chemicals can build up and affect our immune system and blood pressure. Over time this build-up of stress can affect our mental health too, leading to anxiety, depression and other mental health problems. All sorts of situations can cause stress, and the causes will depend on the individual - what may cause stress for one person may not be stressful for another. Having said this, most stressful situations are associated with change or a lack of control. Even if the change is a positive one, it can still be stressful. Stressful events outside the norm of human experience, such as being abused, may lead to post-traumatic stress disorder (PTSD). As previously mentioned, stress is experienced individually and some personalities find themselves more susceptible to stress than others. Having said this, there are certain symptoms that are commonly associated with stress. These can affect us both emotionally and physically. Feeling agitated, frustrated or quick to anger. Having a low sense of self-esteem. Avoiding other people and social situations. Using alcohol/drugs/food to seek comfort. Digestive problems and upset stomach. Experiencing chest pains or palpitations. Then, when you feel the danger has passed, your body releases other hormones to help your muscles relax, which may cause you to shake. If you’re often stressed it’s likely you are producing high levels of these hormones, which can make you feel physically unwell and could affect your health in the longer term. People's tolerance of stress differs, meaning for some the effects will be severe but for others, they will be manageable. When should I seek help for stress? The issue with stress is that it exists as a problem that feeds on itself, and over time lowers your ability to cope. Because of this - the sooner you seek help for stress, the better. As stress is often viewed as simply a 'part of life', it can be difficult to know when outside support is needed. Stress (and the effects of stress) dominate your life. Stress is affecting your physical health. You are using unhealthy coping methods to deal with stress. You are experiencing angry outbursts that are affecting those around you. Recognising the negative effect stress is having on your life, and understanding that this is not OK is an important first step. Once you have admitted to yourself that you need support, you can look into the various treatments available. Your first port of call may be your GP, who will be able to assess your stress levels and suggest appropriate treatments. One recommendation commonly offered by doctors is counselling and psychotherapy. Talking with a professional about the difficulties you're experiencing can help you understand any underlying issues that may be causing your stress - for example, low self-esteem. Working with your counsellor, you will then be able to identify your personal stress triggers and discuss ways of coping with them. When you're ready, you can use our search tool to contact a counsellor. One form of therapy recommended for those struggling with stress is mindfulness. This approach comes from a Buddhist meditation technique and focuses on paying attention to the present moment, rather than worrying about past or future events. Whilst focusing on the present moment you are encouraged to notice how your body is feeling and what thoughts come and go, without judgement. From the theories of mindfulness more specific therapies have been devised - mindfulness-based stress reduction (MBSR) and mindfulness-based cognitive therapy (MBCT). MBSR aims to help lower stress levels through meditation techniques and moment-to-moment awareness. MBCT uses similar techniques, however, it also looks to identify negative thought processes that can contribute to conditions, such as anxiety and depression (the National Institute for Health and Care Excellence recommends MBCT for those with recurrent depression). As well as the above treatments for stress, there are things you can do yourself at home to help manage your stress. Mental health experts agree that the following tips can help ease everyday stress. If you're not sure what it is that's causing your stress, it might be helpful to keep a diary and note down any stressful episodes over the course of a couple of weeks. Aim to include as much information about your experience as possible, including the time and place, what you were doing, what you were thinking about, how you felt physically and a rating out of 10 of how stressed you felt. Using this diary, you should be able to figure out what your stress triggers are, how you cope with pressure and how you could potentially change your reactions. This means getting enough exercise, eating well and taking time to relax. Health professionals agree that exercise is a useful tool when tackling stress as it releases 'feel-good' endorphins, helping you to physically and mentally de-stress. Eating well is another important factor. Eating an unhealthy diet puts your body under physical stress, which can exacerbate any emotional stress you may be feeling. Taking time to relax is key part of self-care and is essential if you want to reduce stress. Aim to dedicate a certain amount of time every day to relax, whether that be meditating, practising yoga, reading, or simply being quiet with your own thoughts. Read Happiful's 5 apps to ease stress. When we are stressed it is easy to rely on unhealthy habits to make us feel (temporarily) better. Such habits may include smoking, drinking, taking drugs or even over-eating. In the long-term, these habits will only create new problems and as they don't directly tackle the cause of your stress, you will continue to feel the effects. 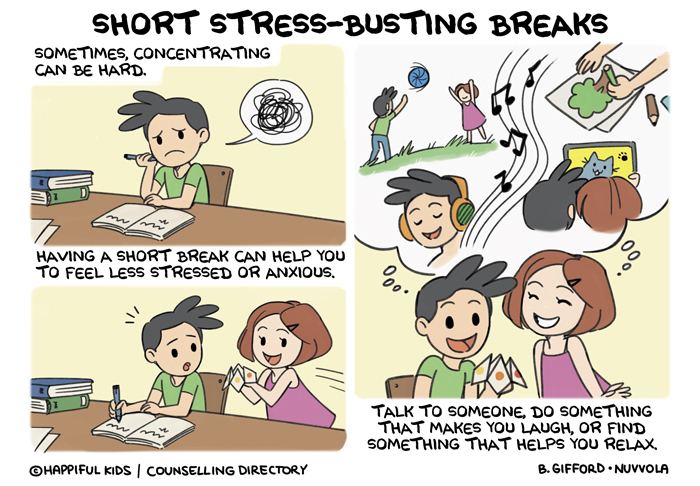 When we are stressed it can be tempting to hide away from the outside world and avoid social contact. But, this can lead to us feeling isolated and even more stressed. Being able to talk through your difficulties with other people - friends, family, co-workers, or a qualified professional - can be a good step towards reducing your stress levels. They might be going through something similar to you, so it can help you feel more connected and may even help you view your concerns in a different light. You may also find that you are able to swap tips and ideas about stress management - in many cases, the release of talking about your concerns can be enough to reduce stress. One of the main reasons people feel stressed is because they feel as if they don't have control of a situation. While it is impossible to always be in control, you can choose to control your approach to a situation. If you remain passive in your thinking (i.e. "I can't do anything about my problem") it is likely that your stress levels will continue to build. If however, you choose to accept your problem and look to find a solution to it (which may involve you reaching out for help), you will begin to feel more in control. If a difficult situation arises and there is nothing you can do to change it, take a step back and accept this. Recognise that there are some things in life you cannot control. Instead, try to focus on what you can control. Relaxation is an essential part of stress management. There are many different relaxation techniques that you can try, many of which focus on relaxing your body and controlling your breathing. In preparation, look to set aside a specific time each day to relax and stick to this schedule and if you can, choose a quiet place away from distractions. Have a good stretch and sit/lie in a comfortable position. Working from your toes up to your head identify any areas of tension. Notice these areas and consciously relax your muscles. Breathe deeply and picture a peaceful scene. If you find yourself getting distracted, count your breaths. Like most things, relaxation takes practice, so don't lose heart if you find it difficult at first. Keep practising and explore other ways to relax, such as aromatherapy or meditation. What should I be looking for in a stress counsellor? Currently, there are no official rules or regulations stipulating what level of training a counsellor dealing with stress needs. There are however several accredited courses, qualifications and workshops available to counsellors to improve their knowledge of a particular area, so for peace of mind, you may wish to check to see if they've had further training in issues regarding stress. The NHS recommends self-help stress management support groups and/or counselling to help cope with stress. 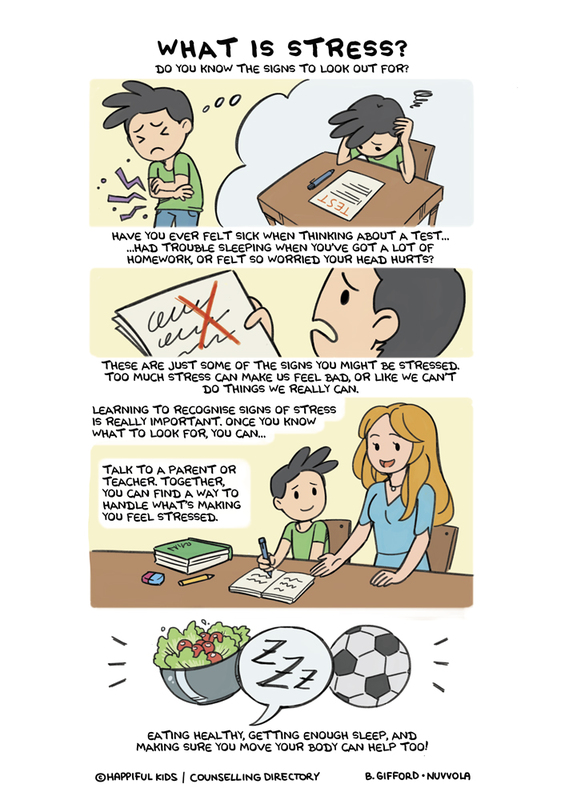 We've created some free resources for parents, teachers and, of course, kids themselves to get a handle on stress. Click below to browse our guides, activities and articles.